The Southeast will hopefully start recovering this week from a "1000-year storm," and there are now questions about the impact of the South Carolina flooding that caused devastating damage. At least 17 people have died in North and South Carolina, most from car accidents during the storm. Damages will cost over $1 billion across the region, according to USA Today. Two weeks of nearly nonstop rain finally eased up this week, allowing state officials to assess the damage, which is especially severe in the state's central Midlands and the Lowcountry on the Atlantic coast. Some of the hardest hit areas saw 20 inches of rain at the flood's peak. South Carolina Gov. Nikki Haley described the damage as "disturbing" at a press conference on Tuesday. The situation was officially named a disaster by President Obama, meaning it will continue to receive emergency and ongoing support from the federal government. At least 40,000 homes lost power, though electricity has been restored to all but 10,000 residents. Drives throughout the central and eastern parts of the state are bringing drinking water to those without. In water bodies near Columbia, residents were told to evacuate due to the rising waters. 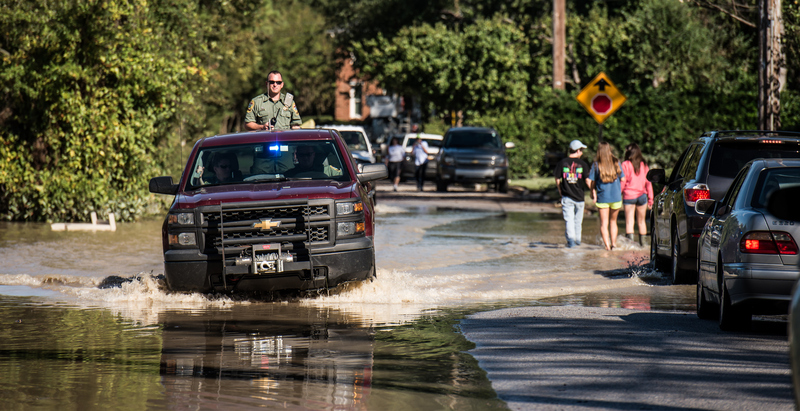 Rescue crews walked door-to-door in the state capital to free those trapped in the floods. At least 18 dams gave way, allowing rising rivers to flood roads and highways across the state. Several of the deaths that occurred were probably caused by drivers ignoring or missing barricades marking closed roads, USA Today reports. National Guard members were called on to help with sandbagging and other protective measures to prevent further damage. Now that the rain has stopped, recovery is on everyone's minds. Due to insurance stipulations, though, recovery may be more difficult than anticipated. Of the 2.2 million homes owned in the state, only 200,000 were insured for flood damage, CNBC reports. Unlike a hurricane or other disaster, floods are generally not covered under most standard homeowner's insurance policies, though most people are not aware of this. FEMA operates a separate flood insurance plan that currently dominates the insurance market. In South Carolina, those homeowners may not receive any aid whatsoever from their insurance companies. Hundreds of road and bridges have been closed indefinitely, including a 75-mile stretch of I-95. Now state officials are concerned about unclean water resulting from the floods, and have issued a boil-water advisory in several parts of the state. For now, the danger of more flooding seems to have passed, but recovery from the floods will take months. "This is not over," Haley said on Monday. "Just because the rain stops does not mean we are out of the woods."